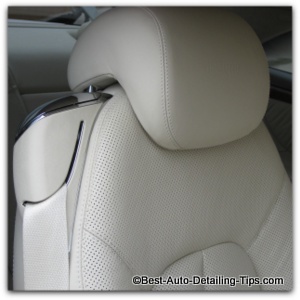 Auto Leather Conditioner is a subject full of much bad info; read up! When it comes to the subject of auto leather conditioner, it is a subject full of bad information repeated by many misinformed people. Just like the area of automotive paint itself, we as consumers have been kept in the dark regarding advances in leather tanning processes and manufacturing. Largely driven by an industry wanting to sell more and more product, it is no wonder these manufacturers have not done their part to inform. With advances in chemical engineering and manufacturing, we now have car leather that is highly resistant to wear and tear of day to day use. 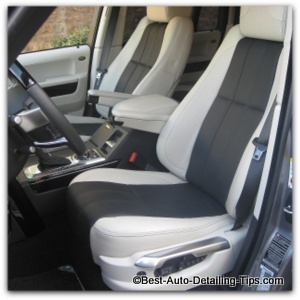 Many of us cling to an outdated fantasy surrounding auto leather conditioner. Thoughts of massaging some glorified car leather conditioner into our car leather that can take it from good to great circulates society as valid and sound truth. Unfortunately, this is outdated thinking that is being propped up manufacturers whose main goal is to separate you from your money. Does my leather really need conditioning? What kind of conditioners are best? What about cleaning my car leather? As society, we are on information overload; the Internet has only complicated this fact. You could spend hours consuming and trying to digest all the information regarding car leather from the various sites on the Internet, only to walk away more confused than ever. This is why I am going to tell you that my opinion is based on actual real life experience straight from the world of 20+ years of professional auto detailing, plus my own personal research. So become an informed consumer and car owner first by learning the basics regarding the leather in your car at car leather care. My research has only confirmed what I have experienced first hand in the auto detailing industry; leathers of today are not the leathers of yesterday. And hopefully you are coming to the same conclusion that I have professionally, and that is that car leather of today is much more user friendly than ever. With modern day dyes, pigments, and finishing processes, we now have car leather that is very resistant to the wear and tear that car leather must endure within our cars, trucks, vans, etc. It also means that the days of searching for the best auto leather conditioner are mostly a thing of the past; I say mostly as I know that old rules die a slow death. Many of you will dismiss this updated idea and continue your quest for the best auto leather conditioner regardless of what my years of experience has taught me. Virtually all car leathers used today are finished with a clear protective coating that is applied for protection and durability of the leather. This means you will actually be cleaning, treating, or conditioning a clear protective layer that is made up of different types of resins, polymers, synthetic this and synthetic that, call it whatever works for you....point is that you are not dealing with the actual leather, but the clear protective layer; just like the clear coat on your car paint. 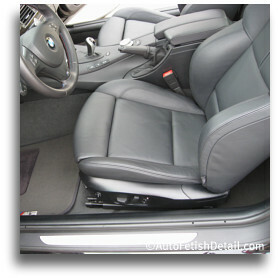 Keeping your car leather clean is the most important and critical part to the health and beauty of your car leather. I have customer's cars (as well as my own) that I have never used any form of conditioner on the leather. What I have done is kept the leather clean consistently over the life of the car, and the leather looks virtually new after over 10 years of daily use. With all that said, I still believe that auto leather conditioners can still play a role in the health and beauty of your car's leather interiors. As I have stated, my professional opinion is that cleaning car leather is the most important task and requirement of keeping your car leather looking healthy and beautiful. 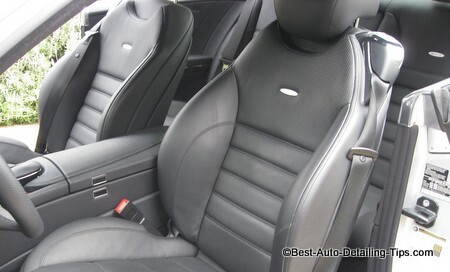 So if cleaning your car leather is really the subject to be discussing with you, then go to my clean leather car seating where I show you first hand what and how I perform this most important task of car leather care. As far as car leather conditioner goes, I use (2) types on the cars I take care of professionally. Either one will be suitable for use on any car leather, regardless of year it was produced. If you have an older car, you just may have car leather that is un-coated with these modern day clear top coats used in virtually every car manufactured today; and yes, this includes the high-end, $150K+ luxury and exotics. Don't think you can apply auto leather conditioner without cleaning your leather first. The only exception is if your car is literally brand new. There will always be some form of dirt regardless of how clean your leather looks...so make sure you clean it first. You can get the Lexol leather kit below that includes a very mild cleaner if you have a brand new car. For anything past a few months old, go to my clean leather car seating page to find out the tips I suggest that I use professionally. 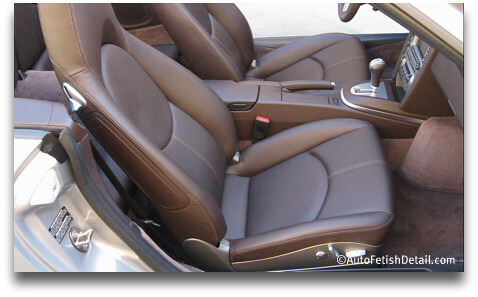 Cleaning your car leather only will leave it with a satin, or matte appearance. If you like a little shine then a dressing or conditioner below is your ticket. As a species (commonly called mankind) we are naturally lazy. The tendency will be for you to skip the cleaning part next time around and simply be seduced into applying a fresh coat of dressing. Be warned as this will create a worse problem over time as you will be rubbing a fresh coat of dressing along with any dirt deeper and deeper into ever crevice or texture of your cars leather upholstery. Over time you will create a nice build-up of dirt and conditioners which will actually begin to deteriorate your cars protective top coat. If you decide on another auto leather conditioner other than the ones I recommend here, beware of the brands labeled as "long-lasting" or "water-resistant" as these silicone based dressings/conditioners will be difficult to clean completely off each time you do clean your car leather. Yes, as society we have all been ever-so obediently trained to accept the "more is always better" mentality that marketing and advertising has been so effective at producing. But when it comes to dressings/conditioners, you actually want a product that will clean off easily each time and therefore allow for complete cleaning of your leather each time prior to a new application of conditioners. Industry leader in car leather care. Kit comes complete with both cleaners and conditioners. Kit for all your leather and vinyl care. Another well known industry leader in car care. Suitable for any new car leather if you stay on-top of your leather cleaning and conditioning. As I stated above, cleaning black car leather is actually easier in a sense as the dirt is harder to see. The problem arises as the cleaning process will usually produce an uneven appearance to the newly cleaned area's of your car; this includes all black leather and vinyl pieces of your car's interior. For this reason I strongly recommend this amazing aerosol product just below. A light spray to the area will not only produce a nice sheen and luster, but will allow you to create a very uniformed appearance. Simply shoot and spray; if you want less shine, a simple quick wipe of a micro fiber will knock down the shine to your desired taste. Use as a superficial car leather enhancer or auto leather conditioner. One of my all-time favorite products. Ideal for use on black car leather after cleaning to restore sheen and to create a consistent appearance to the car leather. Can be sprayed and left alone, or wiped down to reduce shine. Now that you know the insider tips based on real world experience, use these recommendations to find what works for you and your situation. I use the following schedule professionally with my customers cars, as well as my own cars that have leather upholstery. Clean car leather once a month. This can take literally minutes to do if done regularly. A micro-fiber dampened with cleaner and aggressive rubbing is all your particular car leather may require if done so regularly. Use Lexol leather conditioner if it makes you and your car leather feel better. Use the canned aerosol dressing after cleaning any color car leather to create a subtle sheen and consistent appearance after cleaning your car leather. This auto leather conditioner/dressing is especially useful for the black/dark colored leather/vinyl interiors.